GASPARD BAILLEUL. Map. L’Amerique Divisee en ses Pricipales Parties ou sont distingues les ud de autres les Estats, selon quils appartiennents presentement aux Differents Souverains De L’Europe . . . Par le Sr. Bailleul le jeune Geographe. Jean Louis Daudet, Lyon, France, 1752. Approximately 31 x 40 in., on original wooden rollers. Jean Louis Daudet, a Lyonnais map and book seller, published this map of the known states and territories of the New World created by Gaspard Bailleul, a noted Parisian geographer, and his son. Unsurprisingly, the Caribbean, Eastern Seaboard, and California coasts are the most detailed and accurate, while the extremities north, south, and inland are less detailed, leading to some interesting cartographic fables. Bailleul’s view of the Northwest Coast of America, includes the early appearance of the fabled “Mare de L’Ouest” (Sea of the West) and “Presque Isle de Nord Ouest” (Peninsula of the Northwest) in the areas of present-day British Columbia and points north. Perhaps most remarkable is the presence of huge continent, “Indes Meridionales,” (Southern Indies) in the South Atlantic Ocean. Bailleul labels it“Decouverte par le Sr. Binot Paulmier en 1503.” referring to a widely-held belief that Binot Paulmier, an early 16th century French explorer, was thought to have discovered “Terra Australis.” In 1503, Paulmier sailed for the East Indies but was blown off course by a storm. In 1505, he returned claiming to have discovered a “great Austral land” that he also called “Indies Meridionale.” Despite his claims, as well as renewed interest a century later, Paulmier had made landfall on the coast of Brazil. 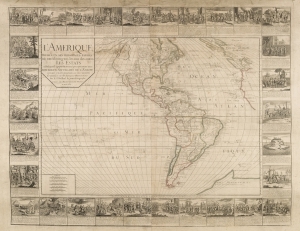 Bailleul’s map provides one of the largest and most ambitious depictions of the unknown southern continent by French geographers and historians. Bordered by 30 vignettes illustrating scenes from European discovery and colonization such as the Conquests of Peru and Mexico, the Discovery of America, Taking Possession of New France, Native Peoples of the North, and many others. Bailleul also provides the journeys of early explorers and circumnavigators. One such site, Drake’s Beach, (“P.te de Drack” ) in present-day northern California, is the location where of Sir Francis Drake overhauled his ships before crossing the Pacific Ocean on his circumnavigation. Very good, original rollers, laid down on modern linen. Minor tears and abrasions.